Preheat your oven to 200c. Line 2 baking trays with baking paper. Roughly chop the raspberries. Put them in a small bowl and place them back into the freezer. Sift the flour into a large bowl. Gently tap each measuring cup once you have filled it with flour to eliminate air pockets. Evenly sprinkle the salt over the top. I prefer to do this instead of stirring them together, because I want the flour to stay light from the sifting. Add the soda water and coconut cream. Using a wooden spoon quickly and gently stir the ingredients, until they start to stick together. If the mixture is too sticky at this point simply add some of the extra flour, until you have a consistency you can work with. Turn the mixture out onto a well floured bench and gently work it into a ball. Only spend a minute or so doing this because you don’t want to overwork the dough. Don’t worry if it doesn’t look perfect. You just need it to be light, soft and not sticky. Wash and dry your hands. Dust your bench top again with a little of the extra self raising flour. Roll the dough into a rectangle, approximately 60cms by 30cms. Stir the cornflour through the frozen raspberries and sprinkle them evenly across the dough. Now roll the dough from the long side onto itself, until you have a log. Cut the log into 10-12 scones. 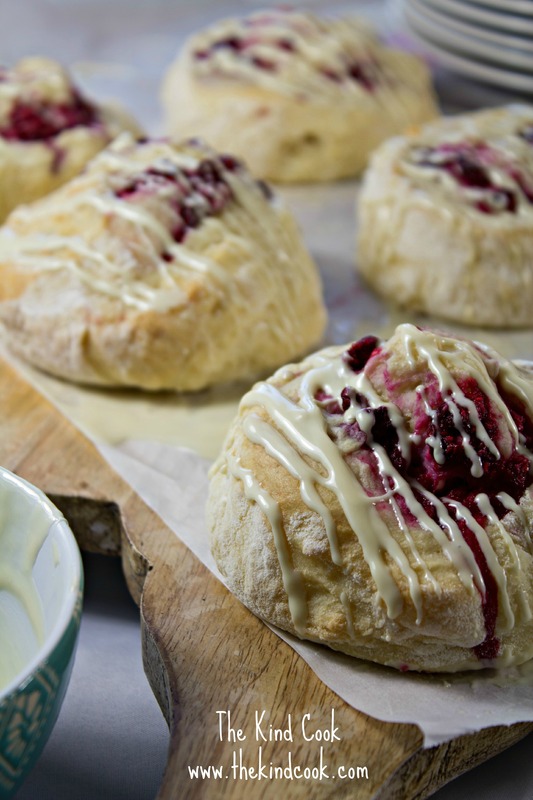 Place them onto the baking trays, leaving some space between each scone. Brush each scone with a little milk. Bake for 20 -25 minutes or until cooked. Remove from the oven. Turn out onto a wire rack and allow them to cool. Drizzle each scone generously with the chocolate and serve. They are delicious served with whipped, maple sweetened coconut cream and a cup of earl grey. Time: 20 minutes preparation. 20-25 minutes cooking. Cooking times will vary with ovens. Notes: When you open the coconut cream make sure you stir it well before you measure out the 300mls. For a sweeter scone you can replace the soda water with the same quantity of lemonade. I prefer this more savoury version though, because it lets the raspberries shine. Plus you have the sweetness from the white chocolate. Don’t worry if your mixture is really sticky at first. Flour can have different “hardness” and can vary greatly. This is why I always have the “extra flour” on hand. Just in case the mixture is too sticky. Simply add a small amount of flour at a time, until you get the right texture. It’s crucial that you do not overwork the scone mix. It’s not like bread dough and it relies on not being over worked.